Inglewood, California, Minus K Technology, Inc. The vault-like, 40-foot diameter, 40-ton door of NASA's Johnson Space Center’s historic Chamber A sealed shut on July 10, 2017, signaling the beginning of about 100 days of cryogenic testing for NASA’s James Webb Space Telescope (JWST) in Houston. Behind the hulking door, the process to transform the chamber’s interior to match the airless, frigid environment of space began. It took about 10 days to pull the air from the chamber, and then about one month to lower the temperatures of the Webb telescope and its scientific instruments to the levels required for testing. The James Webb Space Telescope (JWST) is supported by a set of six custom Minus K vibration isolators that utilize Minus K's new thermal compensator device, a passive mechanical device (patent pending), requiring no air or electricity just like our isolators." says Dr. David Platus, president of Minus K and principal inventor of the patented Negative-Stiffness technology. "The compensator will adjust the isolators as the temperature changes throughout the testing at JSC, keeping the JWST in the proper position." 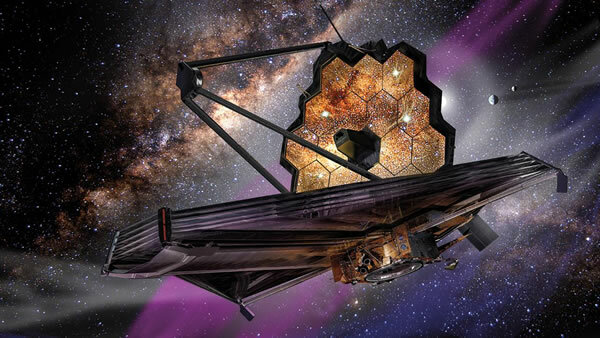 The James Webb Space Telescope is the scientific successor to NASA's Hubble Space Telescope. It will be the most powerful space telescope ever built. Unlike Hubble’s single monolithic primary mirror, JWST’s primary mirror is made up of 18 individual, adjustable segments that will be aligned in space. The JWST is planned to be launched from Arianespace's ELA-3 launch complex at European Spaceport located near Kourou, French Guiana. in 2018 aboard an Ariane 5 launch vehicle. Webb is an international project led by NASA with its partners, the European Space Agency and the Canadian Space Agency. The Pathfinder is a non-flight replica of the Webb telescope’s center section backplane, or “backbone,” that includes flight spare mirrors. The first and second cryogenic optical testing of the Pathfinder were conducted in Chamber A at NASA's Johnson Space Center in Houston, Texas, where the testing of the flight hardware will occur in 2017. 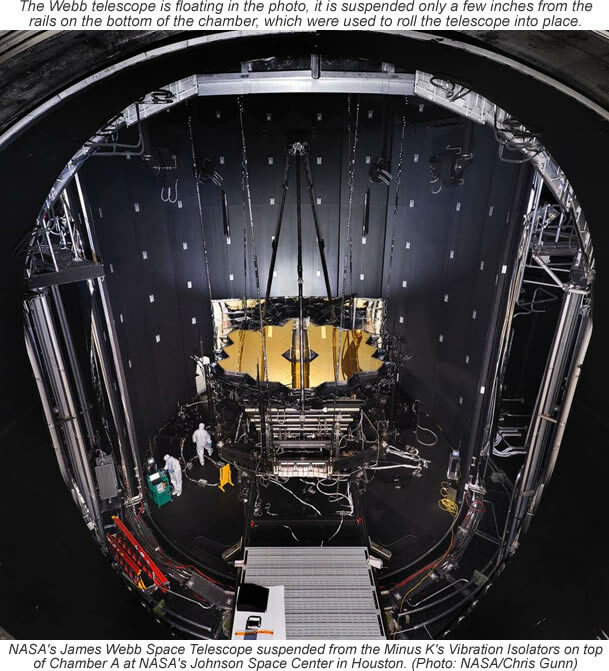 "Now that the second test is done, it means that all optical test systems have been checked out," said Lee Feinberg, Webb telescope Optical Telescope Element Manager at NASA Goddard. Dynamics testing will confirm the telescope and science instrument systems will perform properly together in the cold temperatures of space. So engineers can keep an eye on the Webb while it's being tested, additional test support equipment including mass spectrometers, infrared cameras and television cameras are also being supported by the Minus K’s vibration isolators. The optical test equipment developed and installed by Harris (formerly ITT Exelis) in the Johnson Space Center (JSC) Chamber A, are “Working out great" said KJ Dziak, Harris Primary Analyst ,“The isolators are down to their 0.5 Hz normal behavior.” After recent adjustments with the assistance of Minus K, the isolators provided an improvement in vibration reduction on the two primary mirror segments of Pathfinder under test. The Space Interferometry Mission (SIM) flight vehicle was to be a surveying instrument of unprecedented precision. It was to allow the measurement of stellar positions to a relative accuracy of micro-arc-seconds. This accuracy was to be achieved over a baseline of ten meters between the light collecting siderostat mirrors. This requires measuring distances to the target star to accuracies on the order of 50 pico-meters. The SIM System Test Bed 3 (STB3) was built to verify that the vibration isolation and active optics systems will work together to achieve the dynamic stability goals. A dual stage passive isolation approach was proposed to use isolation first at the vibration-inducing reaction wheels, and a second isolation layer between the bus portion of the space vehicle the backpack) and the optical payload. 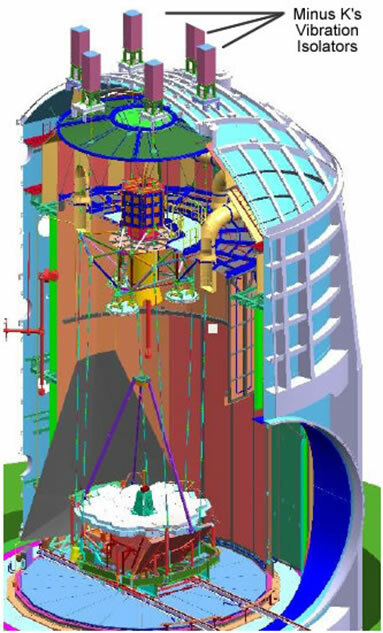 The dual stage isolation approach was demonstrated on a dynamically feature-rich, 7-meter structural testbed (STB3). A new passive suspension that mitigates ground vibrations above 0.4 Hz had been integrated into the testbed. The STB3 suspension utilized Minus K's Nano-K mechanical vibration isolators manufactured by Minus K Technology (formerly sold under the trade name Nano-K). Three isolators were placed beneath outriggers from the structure slightly above and symmetrically around the structure’s mass center in a horizontal plane to ensure stability. The system's natural frequency was 0.4 Hz, vertically and horizontally. The Minus K isolators utilized negative-stiffness mechanisms to negate the stiffness of conventional support springs, producing the low vertical stiffness. An optical-mechanical servo system maintains vertical position within a +/- 0.010-inch deadband by adjusting the force on a small control spring. The servo system is designed to handle small load changes, temperature changes and long term creep of the support springs. 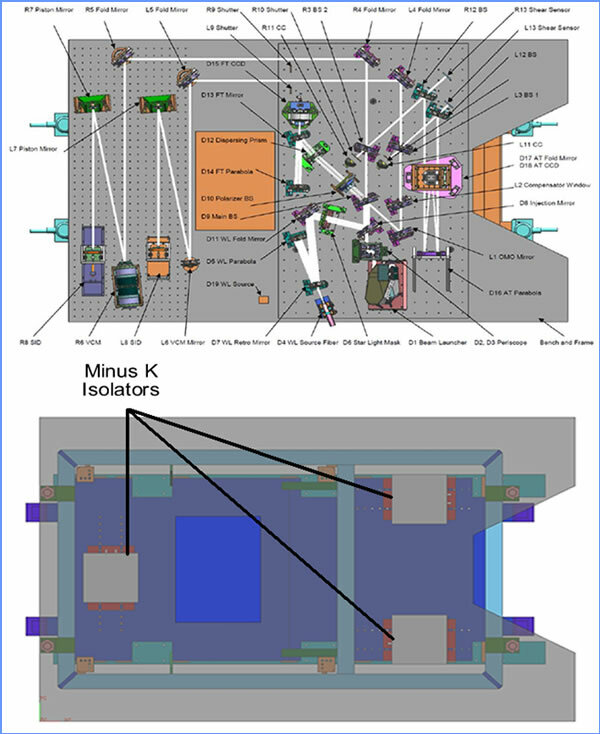 Transmissibility measurements were conducted for the full STB3 structure in order to determine if the stability goals are being met and the NASA Inventions and Contributions Board awarded a NASA Tech Brief Award to Minus K for their contribution on "Dual Stage Passive Vibration Isolation for Optical Interferometer Missions." The Spitzer Space Telescope was a part of NASA's Great Observatories Program and was used to study objects deep within our Solar System and beyond. It first launched in 2003 and completed its hot missions in 2009. The Spitzer Space Telescope used infrared light to obtain images and spectra by detecting the infrared energy, or heat, radiated by objects in space between wavelengths of 3 and 180 microns. The Spitzer Space Telescope captured those celestial objects and phenomena that are too dim, distant or cool to study by other astronomical techniques. The Spitzer Space Telescope (SST) project concluded early in the program that an end-to-end optical and thermal performance test condition under flightlike thermal conditions would be required to assure that the Cryogenic Telescope Assembly (CTA), which contained the telescope and a superfluid helium cryostat would meet the level-one performance specifications in flight. 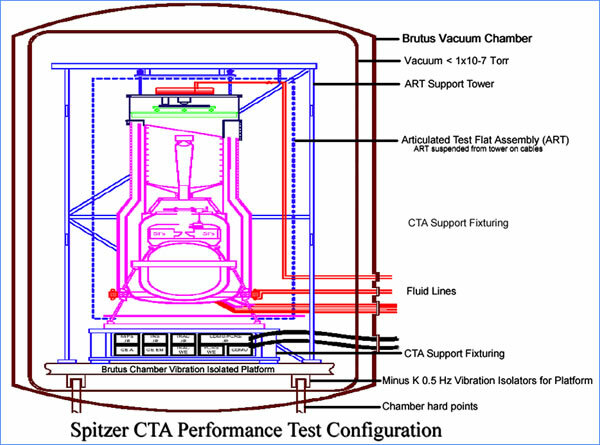 The series of end-to-end tests on the CTA while operating at temperatures near absolute zero were conducted at Ball Aerospace's Boulder Colorado large thermal vacuum test chamber nicknamed 'Brutus'. Ball Aerospace selected Minus K's 0.5 Hz vacuum-compatible negative-stiffness vibration isolation system because of the test chamber's horizontal low-frequency vibrations at about 4.5 Hz. The Minus K isolation system consisted of three custom 1000 lb capacity vacuum compatible isolators that provided a horizontal natural frequency of 0.5 Hz. Materials were selected to meet a vacuum level of about 10-7 torr. The isolators were thermally isolated and heated so they did not have to withstand the temperature extremes of the test. With the use of Minus K's vibration isolators, the jitter in the focus mechanism, a critical parameter for the CTA, was shown to be well within the requirements. The Spectral Calibration Development Unit (SCDU) was built to demonstrate wavelength calibration accuracy and stability between sources of different color and polarization. SCDU was used for the stringent astrometric performance requirements on NASA's SIM (Space Interferometer Mission)-Lite mission that came from the Narrow-Angle (NA) observing scenario. SIM-Lite was a space-borne stellar interferometer capable of searching for Earth-like exoplanets in the habitable zones of nearby stars. SCDU was designed to show that the chromatic effect encountered by SIM-Lite and could be calibrated to the sub-microarcsecond level. SCDU mostly consisted of a white light interferometer with a metrology system and a real-time control system representative of the science interferometer. SCDU came online in 2006 and produced its first results in 2007. The Spectral Calibration Development Unit (SCDU) SIM Lite made measurements of external delay differences between pairs of stars. The differences in spectral energy densities between the two stars couple with the instrument optical dispersion and instrument wavefront error to produce a wavelength dependent delay error. The source of the instrument optical dispersion was the differential material dispersion between the optics of the two arms while the instrument wavefront error results from the differential wavefront error between the two arms. SCDU successfully demonstrated the calibration of spectral instrument error to an accuracy of better than 20 picometers. This performance is consistent with the one micro-arc second narrow angle astrometry. SCDU measured and calibrated simulated spectral sources in the range from 450 to 950 nm. The light sources are intended to simulate the spectral energy differences between F, G and K stars. For the Space Interferometry Mission (SIM) the SCDU testbed used wideband white light to simulate starlight. The white light source mount required extremely stable pointing accuracy. This was accomplished with the use of Minus K's negative-stiffness vibration isolators under the SCDU testbed. The Minus K isolation system consisted of three custom 1350 lb capacity vacuum compatible isolators that provided horizontal and vertical natural frequencies of 0.5 Hz.